My first experience with a GoodReads’ giveaway was not a very happy one. The book was subpar but it was free so my complaints couldn’t be too excessive. I’m happy to say that my second giveaway win was a considerably different experience. 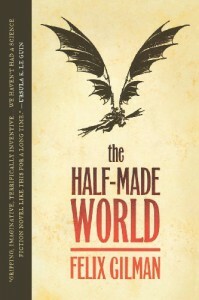 The Half-Made World gets a solid 3 stars – it falls between 3.5 and 4 but I can’t quite bring myself to give it the coveted fourth star. When I first read the blurbs for the book I was immediately reminded of the opening scene in Michael Moorcock’s The Weird of the White Wolf: Earl Aubec of Malador braves the perils of Castle Kaneloon, lying on the edge of the World, and is sent forth by its mistress, Myshella, to create new lands out of the stuff of Chaos. As it turns out, however, that’s not the only point of similarity between Moorcock’s and Gilman’s stories. I can see reflections of Law in the Engines of the Line and Chaos in the Agents of the Gun and the neutral Utopia of Tanelorn in the Red Valley Republic. If I wanted to push the parallels a bit further, I might compare John Creedmoor, an Agent, with Elric of Melniboné – a reluctant servant of uncaring masters who can’t find the courage to give up his addiction to the power that keeps him alive. The stories themselves, however, couldn’t be more different. Many reviews mention that this is a steampunk/Western alternate Earth but I’m not so sure it’s our Earth. The geography is definitely not our Earth’s. The unformed West lies beyond the World’s End Mountains and its contours do not conform to North America’s. There are elements that make it Earth-like. The chronology of discovery mirrors our own: A pass through the mountains was discovered in 1482; the initial colonies are tentative, fragile things; but by the time of the book (1889), the borders of the Made World have advanced considerably. But what those years are based on is never elucidated and there doesn’t appear to be a Church or much of any religion. There are Smilers and Liberationists and the Knights of Labor and other creeds but nowhere are there institutions like the Roman or Protestant churches. The Engines of the Line and the Guns are extra-dimensional powers that may have been called forth by the aspirations and ambitions of humanity. The Engines manifest as enormous rail cars. Even if destroyed, they (like their enemies, the Guns) are reborn time and again, and they form the vanguard of a nightmare landscape of the Industrial Age. I can’t imagine that it’s an accident that their chief objective is “oil.” The humans who live under the Line are stunted, pasty-faced cogs in a vast machine. In this respect, I’m reminded of 1984’s proles and the bleak vistas of Oceania. The Guns are no better. They recruit men and women and imbue them with superhuman speed, strength and healing ability, and employ them in a war to destroy the Engines. It appears to be a hopeless task as the Line continues to advance across the continent and the Agents do little more than commit murder and bring down destruction on the communities they enlist in the cause. The Red Valley Republic was an attempt to create a “third way.” By the time of the story, it’s been a memory for 40 years, having been crushed by the Line. No one on the eastern side of the World’s End Mountains know much about it, and in the West it’s best remembered as a childhood fable but its most famous General turns up in a hospital on the (literal) edge of the World, where it turns out his mind has been destroyed by one of the Line’s more vicious weapons – a “noisemaker,” a bomb that shatters the mind and leaves an mostly empty physical shell. Both the Line and the Guns are convinced that hidden in that mind is a secret that will bring their war to an end so they dispatch emissaries to get it by any means. The tale revolves around three characters: John Creedmoor, an Agent of the Gun; Lowry, a Line officer; and Liv Alverhuysen, a doctor of psychology. Of the three, Liv is the most immediately likeable and – at the end – the strongest of the three. But what I like about Gilman’s characterization is that she’s a real product of his ersatz late Victorian society of the Made World. The most telling aspect of this is her treatment of Maggfrid. Today, Maggfrid would be classified as a high-functioning, mentally retarded person. During Liv’s time at the university, he’s become a special case and travels with her when she heads West. There’s a scene where he provokes some Linesmen into beating him senseless, but the next morning Liv has him hauling her baggage onto the Engine as if nothing had happened. Creedmoor is a coward. He’s become thoroughly disillusioned and disgusted with the Guns and what they make him do and he knows how to get out from under their (figurative) thumbs but he doesn’t have the courage to do it. You could read his and Liv’s flight into the West as his feeble attempt to escape the Guns’ influence without having to give up the Guns’ gifts. By the end of the book, it’s still a toss up whether or not he can find the courage to live without a Gun. There can be no sympathy for Lowry. He’s thoroughly unlikeable, and he’s unable (unwilling) to shake off the Line’s hold on him. At most, this reader could only muster sympathy and horror at the monster into which the Line had shaped him. I haven’t mentioned the Hillfolk. Simplistically, they’re analogs of Native Americans, fairies and black slaves all rolled up together. They are the inhabitants of the not-Made World, and they chose the General for some PURPOSE that accident foiled when the noisemaker exploded. As to the General: Throughout most of the novel, his mind is elsewhere but there’s a point toward the end where he shades into a prophetic figure. In a flashback, we see him writing a letter to his daughter and granddaughter where he laments having to go back up the mountain. This immediately put me in mind of Moses or Jesus or Muhammad going up to God and bringing back his revelations. All these elements came together in this book to make me want to read more. I was “annoyed” to be left hanging at the end but look forward to the story’s resolution.